So I made it to New World Notes with the blog post that I wrote about family stuff! You can read about it right here. And a big thanks to Hamlet for the questions because as many times as I’ve been asked to write about SL families, I have rarely been presented with many questions other than “So why are you doing this?” *laughs* Which is a valid question, of course, but doesn’t lend to a very long conversation. Speaking of family, we had our traditional 4th of July party this past weekend! It was wonderful, as usual. This was actually the first time in a LONG time that the whole family was able to be together, so that made it more wonderful. We had food and music and dancing, and of course, fireworks! If you follow me, or any of my family, on plurk, then you have seen a lot of our photos and gifs already. And on that note, I’m going to log in! So Hamlet from New World Notes gave me some questions to answer about being in a Second Life family! I definitely don’t mind answering things when asked, especially about family life in SL, just because I feel like it’s one of the more misunderstood sections of SL. People seem to just get it when someone wants to be naked all the time, or wear a collar, or sing for money, or design a dress, or be a cat or a vampire or a jerk. But for some reason, family life is unacceptable to some people. And I know what that’s like, I do. I didn’t quite understand it myself until I got into it. But just as a disclaimer, this is how family life in SL is for me personally. If you’re in a family or have been in one before, your experience is probably a bit different. Let’s get on to the questions! 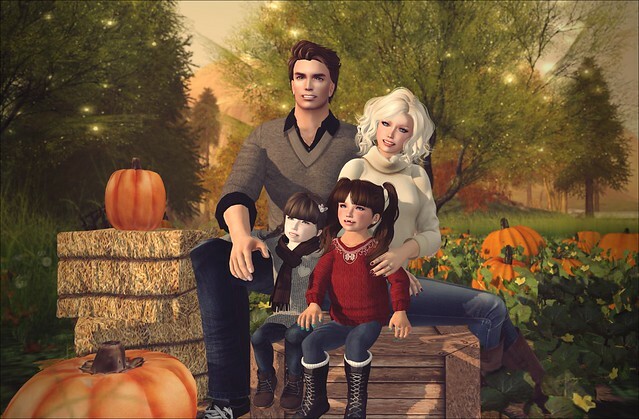 What inspired you to have a virtual family as opposed to just a virtual boyfriend? When Aldywn and I partnered [married] in SL, the first question people asked was, “Are you going to have kids?” I think some people said it as a joke, but it was something that was always kind of in the back of my mind. In my real life, I can’t have children and I’ve always wanted them. In SL, we can do and be almost anything we want that we can’t do in our offline lives. If someone who doesn’t have the use of their legs in RL can come to SL and dance, why can’t someone with fertility problems come into SL and have a kid? My friend Renee [who passed away in 2012] had congenital muscular dystrophy and was in a wheelchair and had a breathing tube. But in SL, she had a wedding, she danced, and she got to experience motherhood. 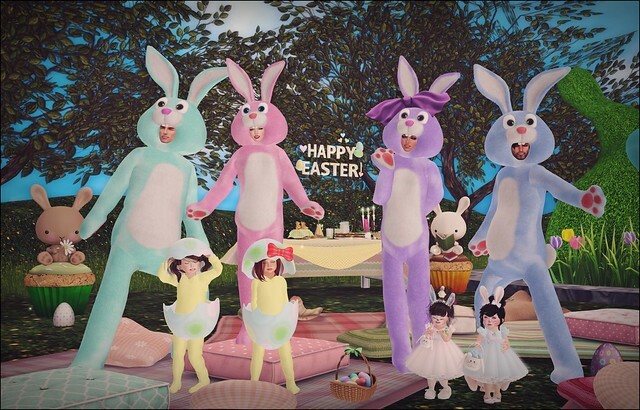 To me, this is one of the better uses for Second Life – to do the wonderful things that your real life might not let you do. What does your RL family think about it? As far as RL family goes, I only have my parents, and they don’t understand anything internet related! No, really. My parents are in their 70s and one time my mom asked if I had a “Twitter machine” because she didn’t get that Twitter was something on the computer. But they know I have had online friends since 1998, so to them, this is no different. My RL boyfriend absolutely knows about my online family. It would be hard to hide it when he hears me talking on Skype to Aldwyn or the whole family, and sees me holding the girls! He doesn’t really fully understand it, because our not having kids doesn’t affect him like it does me, but he knows it makes me happy, and that seems to be good enough for him. He’s quite supportive of my online life because it makes me happy and because I never let it interfere with anything we want to do together in RL. Balance is important! Do you know your SL family in real life? How do I answer this one? No, I have never met any of my family in real life. None of us have ever been face to face. But I feel like I know them because we share so much of our real lives with each other. I know schedules and phone numbers and workplaces. I’ve seen pictures and videos. I know about their RL families. Abby and I have each other on our RL Facebooks. Birdy has let me send her a gift to her house. Maybe some people would think because we’ve never been in the same room, we don’t know each other, but I feel like we do. And if so, tell me a bit about who they are in real life. I don’t really want to spill their secrets. 🙂 So I’ll just be general about it. In my entire SL family we have parents, grandparents, teachers, nurses, gamers, musicians, and more. Everyone has a great life story, and we love to share with each other. This also means that we don’t all have a lot of time to be in SL together, so we take our moments where we can. Finally, what RL need or desire does having an SL family satisfy in you? Well, as I said before, I finally get to be a mom. It has always been a big deal to me that I haven’t been able to have children. In fact, it sent me into a depression for a long time after I found out that it just wasn’t going to happen for me. And adoption, unfortunately, is not in the cards for me in RL for various reasons. Also, my immediate family is very small. I have never had a sibling close to my age because my sisters were quite a bit older than me when I was born, so I was basically raised as an only child. It’s just my parents and me now, and the rest of our extended family all live very far away. So having my SL family helps me so much to feel connected to something. The fact that we live in the same place in Second Life is even better! And now some photos, and a little video I made earlier this month talking about family stuff.